The charcoal paper is no longer on the market today, and this has been the case for many years but in France you can find a workshop where Michel and Jean-François FRESSON handle direct charcoal process. They are the grandson and great-grandson of the inventor Theodore Henri FRESSON. They carry out world-wide famous work, for the museums, national archives, collectors and some photographers, followers of new ways of expression or advertising directors. This is done with the shade of pigment wanted but most of the time with black ivory on smooth, vergé, or watercolour paper. The print is carried out straight from the original black and white negative, size between 24 x 36 mm and 13 x 18 cm with a technique made possible by a continuous and artificial source of UV radiance, an arc lamp of strong power which lights up the negative and the print is directly focussed on the pigmented paper by a lenses corrected for the UV spectrum. The exposure takes a relatively long time but the intensity by the source is constant and enables enlargements up to 60 x 80 cm. The structure of the emulsion and its treatment are the same as those created one hundred years ago. It is Pierre FRESSON, one of the inventor's, who in 1952, executed the first print in direct charcoal colour ( without transfer). The enlargement described previously is the same but a previous technique of colour separation in black and white negative enables the pigmentary print to be made. From an original negative, or slide, the subtractive analysis of the first three colours is made by contact on a plan-film panchromatic black and white. These negatives are used directly and successively for the exposure by enlargement of each pigmentary emulsion. On a paper of cartoline type, without barite and without shrinking, emulsified in cyan pigment, sensitised and dried, the first primary coat is made by enlargement corresponding to the negative image of selection operated under red filter. After the development of the first primary coat, the paper is dried, then emulsified in yellow, then sensitised and exposed by enlargement with the negative done under the blue filter. This yellow monochrome superimposed on cyan is developed. The print is emulsified with the last primary pigment magenta, sensitised and enlarged with the negative made under the green filter. The pigmentary emulsion is treated, and at this time, the three primary colours are put down on the support, operating the total synthesis of the colours by subtractive selection (cyan, yellow and magenta matching together in infinitely variable proportions, building up the unity of the visible colours). Les grands Maîtres du tirage : Editions CONTREJOUR. Dominique GAESSLER On account of the systematic imperfection of all the primary colouring pigments ( for example the cyan pigment, neutral in theory, throws back a little red radiation) and identically to every photomechanical process (cyan, yellow and magenta superimposed in good density should not throw back light in theory, but in fact we can see a strong dominating brownish colour in the shadows) a coat of black pigment by its covering power, is laid on the print to increase and neutralise the high density. 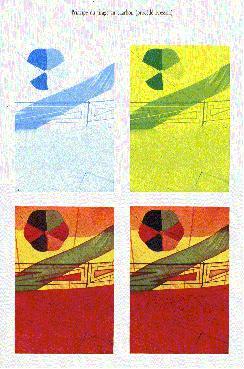 The trichrome print is emulsified, sensitised and enlarged with the negative made with the green-yellow filter. The print in quadrichromie has its last treatment. After a long wash to clean up the dichromate, the print is naturally dried and put under a warm press. After, there comes the retouching. The print is finally covered with a light coat of gelatine which will protect the image.